Pivotal: Highlights From the Permanent Collection, the temporary reinstallation of the masterworks at the Orange County Museum of Art, proves that museums with the flexibility to take these kinds of creative risks absolutely should. 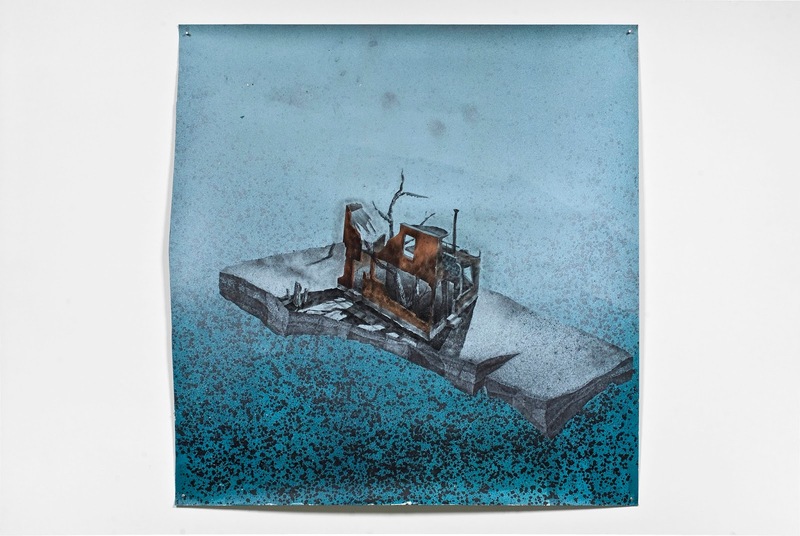 For the most part, Pivotal, on display through February 2018, is a creative and thoughtful reinvigoration of the connections between the big names of contemporary art, using both formal and thematic links to bring new details to the fore. It's also an excuse for the museum to show off some newer pieces for the first time, demonstrating that the curators are both paying attention to particularly groundbreaking and dynamic younger artists while also making sure that the entire collection (with some big names like Warhol, Opie, Diebenkorn, Andre, Irwin, Ruscha, and Baldessari) remains cohesive. As with the best art exhibitions, the success lies in the small details. Opening with the delicate but vibrant Irwin installation "Untitled (#2220)" in its own small room is impressive on its own. Yet Pivotal as a whole becomes even more satisfying when you realize that one of the works in the last gallery of the exhibition, Larry Bell's etched glass cube simply titled "Untitled," is deliberately placed to echo the Irwin. While Irwin's mixed-media sculpture is characterized by effervescent blurring of edges as projected lights incorporate the wall of the space into the work itself, Bell's "Untitled" is lit so as to cast its own light show on the wall behind its pedestal, bringing the entire exhibition full circle. The first standout work, however, is Eleanor Antin's "100 Boots," a display of thirty-six black-and-white photographs of one hundred pairs of tall black rubber boots in various settings and formations. One of the pioneers of "mail art," Antin sent these images as postcards to locations all around the country, mirroring the journey of these odd and human-like boots as they travel through wild landscapes to densely-packed cities. While I had seen "100 Boots" previously at the Orange County Museum of Art, it wasn't until this second look that I finally was able to appreciate just how Antin's staging of the boots, as well as the locations she photographed them in, encourage the viewer to imagine all of the different kinds of people--and the interactions these people have--implied by the boots. Antin's pairs of boots huddle in corners, march in neat rows, cluster around a small square dance floor in rapt fascination, cross a Manhattan street in a perfect line, stagger around a patchy hill, huddle under a pier, or sleep in piles in a truck. The boots, then, stand in for the near-infinite combinations of ages, social groups, occupations, relationships, and other markers of the people who would be wearing them. Antin's photographs are not only snapshots of American landscapes and settings, but are subversive portraits of all different kinds of people in America. 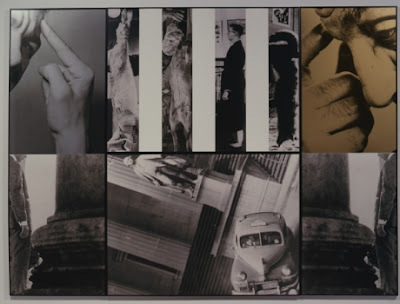 Another standout of Pivotal, located in the following gallery, is John Baldessari's photo set "Ordered Thought (Silver and Gold)," a triumph of gesture and form. 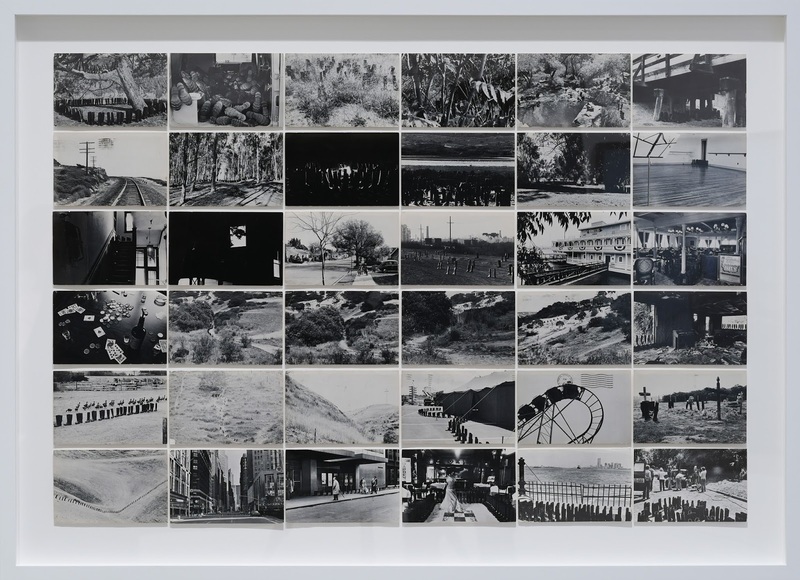 The work is divided into two rows of three images each, separated by thin black frames, and are, at first glance, a cacophonous-seeming combination of close-up and long shots, making use of repeated images and jauntily skewed angles to move the viewer's eye around the composition. On the top left and right-hand corners, two fragmented images of pensive men pressing fingers to their furrowed brows seem almost Classical-inspired, conveying--and predicting--the initial sense of confusion created by the work in its entirely. The angles of the fingers direct the eye down towards the bottom center image, which depicts a car, seemingly turned on its side, in an urban setting; the line created by the finger of the man in the top right image and the architecture in the bottom center image is nearly contiguous. Meanwhile, the negative space created by the columns in the mirrored photographs on the bottom left and right directs the eye back up towards the top center photo, a fragmented set of snippets depicting animal carcasses and a living human man, all rendered in extremely narrow vertical images that have the effect of actually drawing parallels between the carcasses and the man. Once again, the white negative space between these sinister shots of bodies draw the eye down towards the center bottom image of the car, relating the overturned car, and the topsy-turvy setting it rests in, to those plainly presented images of death, implying that soon, too, will the living man amidst the carcasses join their number, giving the thinking men at the top left and right the look of a funeral sculpture, already in mourning. While the visual rhyming of Kristen Morgin's purposefully dilapidated clay "Cello #6" and Nathan Mabry's smoothly finished terra-cotta "Shapeshift (Jaguar)" provides a taste of the curators' keen appreciation of juxtaposition, two of the final galleries in Pivotal reveal a much grander and more playful sense of organization based on form and color alone. The first of these spaces is almost an ode to a limited palette of gray, copper, white, and light brown, as all of the works, including Vija Celmins' "Moon Surface (Luna 9) #2," Betye Saar's "Miz Hannah's Secret," and Bruce Conner's "Bedroom," comprise combinations of some or all of these precise hues. And while naturally the dominant form of the modern/contemporary painting, the rectangular canvas, reigns supreme in this room, the elegance of the limited color scheme makes that very simple shape stand out in stark relief. On the whole, it's the most successful grouping in Pivotal. The final gallery comprising Pivotal contains a similar homage to the square/cube/rectangle (and, for the record, includes one of the relevant Albers compositions in the grouping) on a purely formal level. 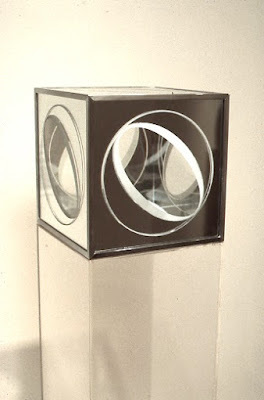 The positioning of Sol Lewitt's "Incomplete Open Cube" in front of Billy Al Bengston's "Tom" is a particular stroke of genius, as the large white Lewitt sculpture's implied cube, and its generous negative space, echoes Bengston's painting, which uses hollow cylindrical forms to form a kind of incomplete, off-key square/cube form. Patrick Wilson's "Insomniac," is an electric, jittery homage to Albers' own homage to the square on an adjacent wall, but, strangely, no interpretive text exists to relate the two works aside from the very obvious visual similarities. It is in this room where Larry Bell's "Untitled" provides the continuation to the thread Irwin began at the beginning of the show, and seeing the refracted light from the Bell work nearly caused me to squeal with delight. Collection of Orange County Museum of Art; Gift of Edwin Janss, Jr.
Where Pivotal falls short, unfortunately, is in several instances of the interpretive program apparently hedging its bets to avoid any kind of political controversy. In one example, the label text for Edgar Arceneaux's "Blind Pig #1" mentions the artist's engaging with "racial and historical violence," and then obliquely mentions that the work refers to the events that eventually led to the 1967 Detroit riots --using the incredibly charged term "riots" without actually naming what those events were. (In media usage, "riots" has connotations, both related to the race of the rioters and to the perceived violence and unruliness of the act, that "protest" fails to evoke.) Perhaps the museum was anticipating visitors who would know information about the aforementioned riots (or even remember them) without having to look up further information. But for the label to evince that Arceneaux's oeuvre in general deals with (unfortunately evergreen) racial injustice and strife while refusing to specifically place "Blind Pig #1" in that context comes across as unwilling to engage with the social implications of the work on display. It would be as if the label of a hypothetical work addressing the beating of Rodney King at the hands of police officers mentioned only that "events" led to the 1992 Los Angeles Riots without actually naming what happened to King as a direct cause. On a more technical level, a more judicious selection of which works received label text might have been in order. Charlie White's utterly bizarre photograph "Ken's Basement," which depicts a group of children celebrating in a room along with a truly horrifying creature with human-textured skin and eyes, screams out for some kind of description of what we are seeing, even if it's just a mysterious statement from the artist. Any kind of a roadmap, no matter how simple, can work wonders in terms of allowing viewers to be in on the joke to some degree, and would probably have made me appreciate the photograph more. The museum's dedication to a relatively even gender ratio, as well as to a fairly diverse grouping of artists, is commendable. Works by Jennifer Steinkamp (who seems to be everywhere these days) Kori Newkirk, Rodney McMillan, Hank Willis Thomas, Mary Heilmann, Amanda Ross-Ho, Helen Lundeberg, Nancy Reddin Kienholz, along with the aforementioned contributions by Saar, Morgin, Opie, and Antin, make clear that the OCMA is committed to showing a wide range of contemporary art beyond the usual white guy marquee names. I only wish that Pivotal had a longer lifespan at the museum, because its successes largely outweigh its shortcomings where it counts; the show should be a model for how other institutions can keep their permanent collections fresh, relevant, and meaningful.